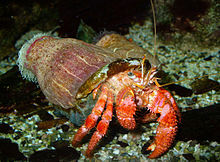 Found from the tide pools to deep water the Hermit Crab is primarily known as a scavenger. These crabs lack a shell over their abdomen. That is why they seek out the discarded shells of dead snails. With these shells they are protected from predators (one good reason to leave shells you see in the tide pools). As the crabs grow they are constantly looking for another, larger shell. Different species along this coast actually prefer different types of shells to inhabit. Check out this YouTube video of the battle it can be for a hermit crab to claim a new home.